Bombus vandykei is a large yellow and black bumble bee. They are found along the western coast from California to Canada. It is found in Mountain-meadow, forest, grasslands, semi-desert, and tropical montane forest habitats. Bombus vandykei is characterized with a short to medium length tongue and is most likely to visit shallow flowers. 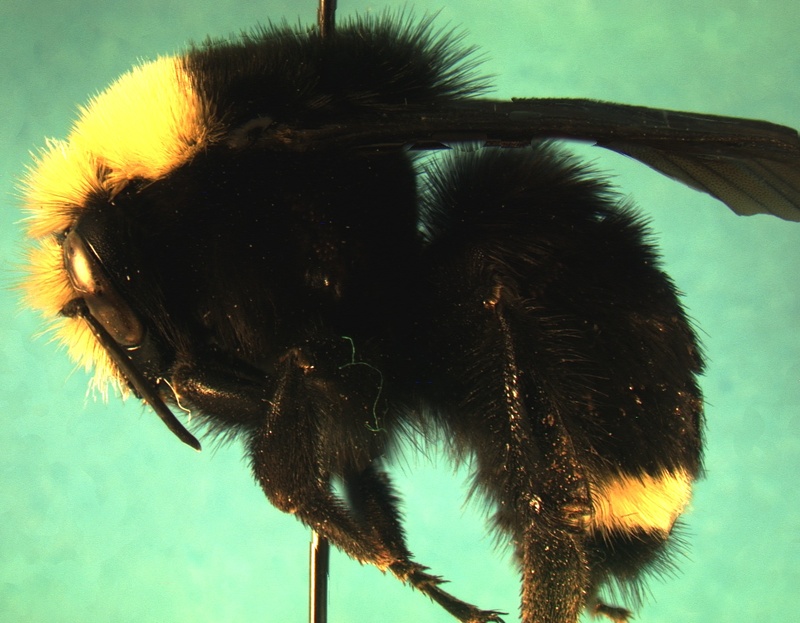 Bombus vandykei is more likely to hang upside down than other bee species. They provide “buzz” pollination or sonication, which is a technique used by Bombus vandykei to release pollen which is firmly held by the anthers of a flower and makes pollination more efficient. The Bombus genus of bees nests underground or on the grounds surface and are in small colonies with short cycles. Males search for mates by patrolling circuits for scent marks. Can reach speeds of up to 15m/s (54 km/H). They use their long tongue, known as a “glussa” to extract nectar and collect pollen in their pollen basket or “corbicle”. Nectar and pollen is collected. They then return nectar and pollen to the nest and to share and feed the brood. Bumbles, unlike honeybees only store their honey for a few days. Bumble bees have the ability to sting more than once because their stingers are not barbed. - Fall: Young queens mate with drones. - Winter: Diapause in a sheltered area. - Spring: Queen finds location for colony and begins to lay her fertilized eggs into way cells. Fertilized eggs hatch into workers, and unfertilized eggs develop into drones. This page was last modified on 2 June 2010, at 22:10.